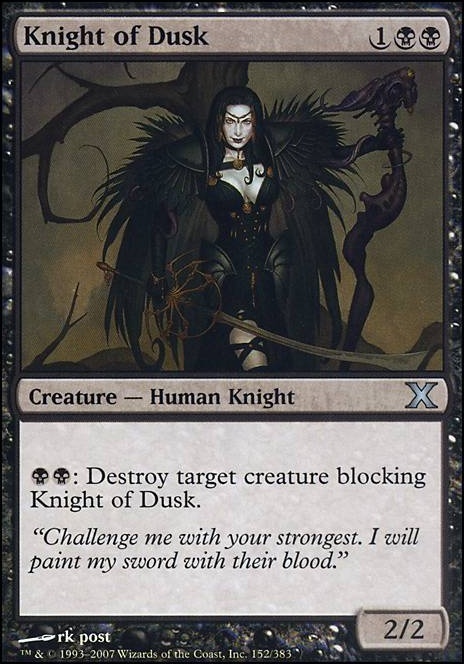 (Black)(Black): Destroy target creature blocking Knight of Dusk. Good_knight Well I really don't know what you have so that makes things harder. I can offer some suggestions but that kind of depends on your meta. What is your playgroup like or are you talking about local game store? Do you play 1v1 or more? If your 1v1 I suggest more spot removal. This should help you buy time to get your engine online. There are a ton of cheap options as white and black are good for this. If you have a local game store near buy, you might be able to do get these pretty easy. Afterlife, Swords to Plowshares, Blazing Hope, Crib Swap, Mortify, Profane Procession (this would be a good card for this deck even when you move beyond it simple trickets). Unmake, Walk the Plank, Go for the Throat. You get the idea. Ok so some ideas for improving your creature pool. I tried to keep this pretty cheap. Dauntless Bodyguard, Chieftain en-Dal, Fiendslayer Paladin, Kinsbaile Cavalier, Knight of Dusk (A great cheap card for this deck. Just make sure you always have the mana up to destroy. Since it can be played at instant speed you can kill their creature after blockers are declared and damage is done. This is one of the reasons you should wait until second main to play nonessential spells. Lightwielder Paladin, Knight of Sursi, Mirror Entity, Pentarch Paladin. Some enchantments to help out: Glorious Anthem, Behind the Scenes, Archetype of Courage, Archetype of Finality, Brave the Sands, Intimidation, Knighthood. Artifacts and lands: Whip of Erebos, Fellwar Stone, Rupture Spire, Path of Ancestry Unclaimed Territory . If you want to splurge a little bit get an Isochron Scepter and put something like Go for the Throat on it. This are just suggestions. Take all or some. On August 10th the new preconstructed Commander decks come out. In the past these have been pretty awesome for right out of the box. You can always tailor make them. They are normally worth well over the MSRP. Also don't let the prices here scare you too much. They are just a generalization. You could go to tcgplayer and get better values. Even after you choose, they can optimize your cart to get a lower value. I wonder if a creature count closer to 30 (or more) would help with the tribal synergies (or with Athreos triggers if you keep it). I'm thinking of Knight of Dusk, Knight of Dawn, and the like. Haakon, Stromgald Scourge seems like a great recovery card. Stoneforge Masterwork might be cool. You could also sac your tokens to something like Vampiric Rites for card draw. Call the Bloodline and Sorin, Grim Nemesis might be fun. You could also include Exsanguinate and/or Torment of Hailfire to complement Altar and Debt. Cavern of Souls might be good. Maybe Path of Ancestry if you use Aryel. 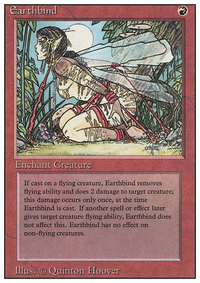 Maybe more anthem effects, as well, and cost reduction cards to help ramp, like Coat of Arms, Door of Destinies, Vanquisher's Banner, Herald's Horn, Semblance Anvil, Urza's Incubator. There's also Crusade, Honor the Pure, Divine Sacrament, Metallic Mimic, Mirror Entity, and Bad Moon. The big idea, I think, is to increase your creature count, add more anthems, and play a few alt win cons (like Altar + X spells) and a few bring-everything-back spells. Otherwise, you might get caught between your tribal plan and reactivity. You might want to consider splashing blue for more draw and discard spells like Dimir Guildmage and Dire Undercurrents or even Drastic Revelation. Frantic Search might be a good one too. Those can all add to playing things from the graveyard as well as having stuff in your hand. I'd take out Stillmoon Cavalier and maybe sideboard Arrogant Bloodlord. Fists of the Demigod and Knight of Dusk fit well too. You could always add Terminate if you wanna be that guy. Cool deck idea though, would love to play against it. Oh man you could absolutly do Orzhov, Boros and Rakdos! Think along the lines of Knight of Infamy, Black Knight, Knight of Dusk, Stromgald Crusader, Ashenmoor Liege, Order of Yawgmoth, Blood Knight, Hanweir Lancer and Hero of Oxid Ridge. Scathain thank you for these suggestions I will probably take all of them except one. Knight of Dusk is good to kill off creatures aswell. It is used to help me possibly put more stuff in their graveyard. Also you can't cast your commander for the ninjitsu cost so I don't need unblock able. All of the other suggestions will be duley noted and the deck will be advised within a week. Thank you!! The Urborg Panther, Breathstealer and Feral Shadow combo isn't going to come off often at all, and those creatures are a bit sub-par otherwise, so I'd drop those. Knight of Dusk is also a bit overpriced, its essentially going to end up being a 2/2 unblockable for 3, except slightly worse. 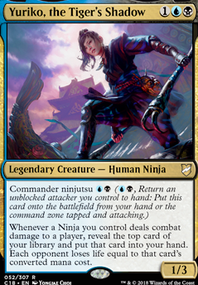 I'd replace those with things like Tormented Soul, the dauthi, an Ornithopter, or a Signal Pest to trigger your commander's ninjutsu. For defenses, you might like Ophiomancer and Royal Assassin, both of which should usually outperform Wall of Corpses, and the latter of which would help out your Scarblade Elite. I'd also consider putting in a Ruthless Ripper, which is good either for defense or for triggering ninjutsu. You also might consider other stuff that like creatures dying, such as Toshiro Umezawa, Harvester of Souls, and Reaper from the Abyss.